GlassOuse is advancing mobility for people with disabilities one product at a time. Their latest assistive device looks like a pair of glasses that a user wears to control smartphones and computers hands-free. This sleek technology also works with tablets and Smart TVs via Bluetooth. 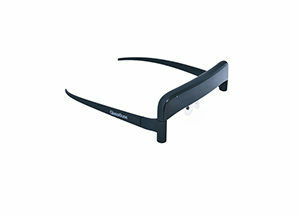 Designed for daily use, the glasses come with two ear holders, a charging cable, and user manual. They offer long battery life, compatibility with a whole host of electronic devices, sensitivity adjustments, wide-angle viewing, and quick response time. They are ergonomic and non-carcinogenic. GlassOuse tracks even slight head movements to move a cursor precisely where the user wants it. The glasses can be paired with their Bite Switch product for a click action. GlassOuse currently costs $499 for a complete set, the Bite Switch sells for $49, and you can get a silicone cover for it for another $5.